The solution for drilling depths of up to 10XD by indexable insert. 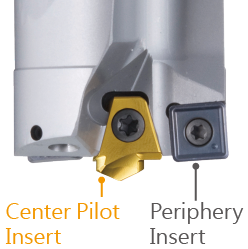 The patented pocket, center pilot and periphery inserts make smaller chip smaller, steadily drilling deep hole, and longer tool life. -Patented pocket design, supporting edge to absorb lateral cutting force, provide best accuracy and rigidity of center insert. Special geometry design, benefiting in guiding position, eliminating the defects cause by the chip flow from the gap between the center drill and insert. High precision ground and edge honing to increase tool life and surface finish. Patented insert pocket to absorb the cutting forces, supporting insert while drilling. NC2032 : K20F grade, for carbon steel, alloy steel C< 0.3% and stainless steel. 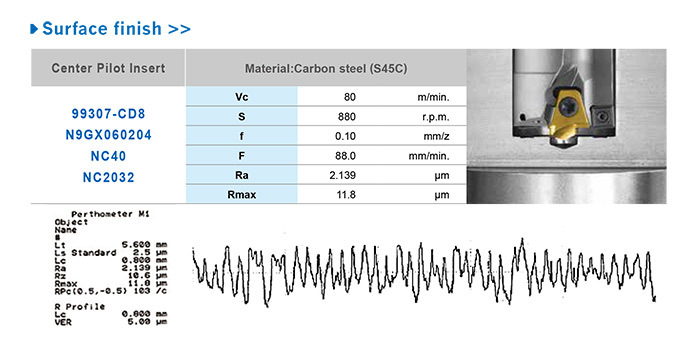 NC40 : P35 grade, for carbon steel, alloy steel C > 0.3% and stainless steel. Patented dual-relief angle and honed edge insert, good for chip breaking and longer tool life. NC2032 : K20F grade, for carbon steel, alloy steel, cast iron , stainless steel and hardened steel up to HRC50. NC40 : P35 grade, for low carbon steel and stainless steel.